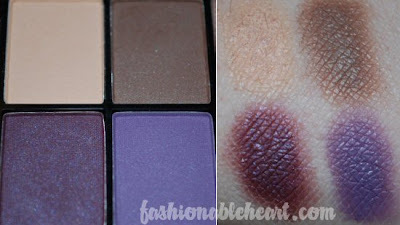 Continuing on with my NYX palettes, here are my swatches of Versus. I'm a bit disappointed in my swatches this time. They came out a little blurry and I think that's because it's very overcast today. I don't think they are bad enough that you can't see the true colors, though. I love that this palette dedicates the top row to neutral colors and the bottom to mostly purples. The most pigmented are the two brown colors in the second swatch of colors. And the most unique would be the first purple in the second swatch. I don't think I have a color exactly like it- a muted purple with golden shimmer. It's gorgeous! 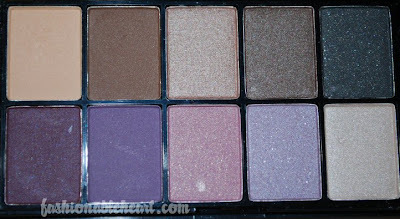 If you like purples, I really think this is a good palette to try out. Whoa! This palette is gorgeous! Purples and neutrals are my favorite color choices...I'm surprised I don't already have this. Thanks for sharing!